Chuck those chemical hand wipes in the bin. PhoneSoap has your back! 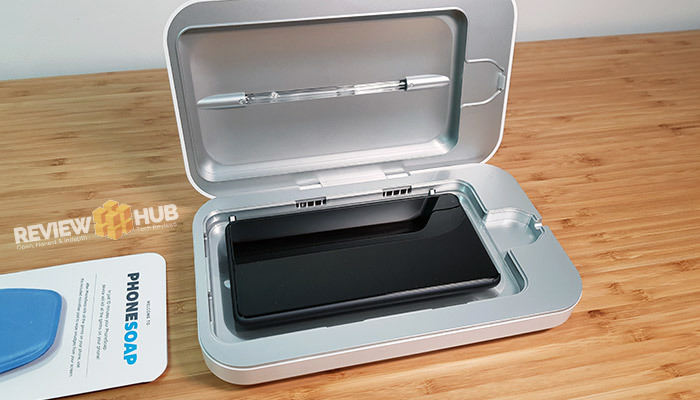 From Shark Tank to Review Hub, we get hands-on with the PhoneSoap 3 Smart UV Sanitizer! After seeing PhoneSoap on Shark Tank (FYI a much more exciting version of Dragons Den), it was only a matter of time before it made it across the pond to us. Learning that there are more germs on your smartphone, than on a public toilet, is enough to make most of us cringe. Then I connected the dots… you wash your hands after going to the bathroom right, but not your phone. And as someone who carries hand-sanitizer around with me 24/7, it was about time I upped my smartphone hygiene. Related: Waterproof, tough & rugged smartphones. So I contacted the lovely guys over at PhoneSoap and got myself their latest model. 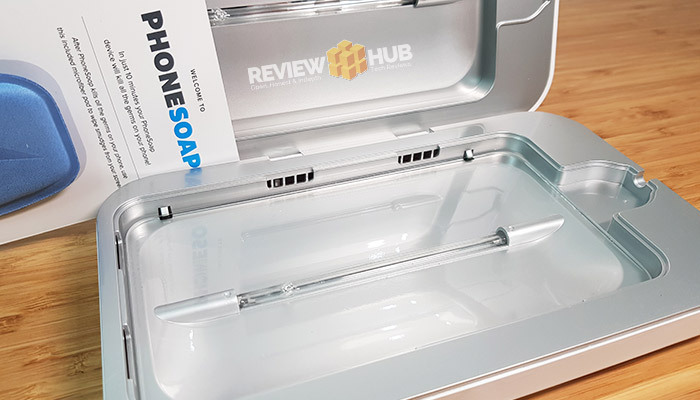 While it’s a pretty handy gadget to have here at Review Hub HQ, I can see the PhoneSoap sanitizer being used in most homes. So let’s get to it, here’s my Full UV-on PhoneSoap Review. While putting your phone into a plastic container with lights for 10 minutes has hints of snake oil, it’s actually pretty well known science that UV-C light (shorter Ultraviolet light waves) has germ killing properties. Germicidal lamps, like the PhoneSoap, kill 99.99% of harmful bacteria. So by placing your smartphone into the PhoneSoap, you can zap those germs so hard that their DNA explodes! Or more scientifically, deactivates or destroys the bacteria’s DNA leaving them unable to perform their vital cell functions. But why should I care? I wash my hands all the time. The problem with smartphones is that we’re all totally addicted to them. We carry them everywhere, pulling them in out and of our pockets constantly. And this is what causes the problem. Say you touch a door, pick up some nasty influenza germs, check your phone, go home and wash your hand. Guess what? Next time you touch your phone you can be re-contaminating yourself with these germs. Always better safe than sorry, right? 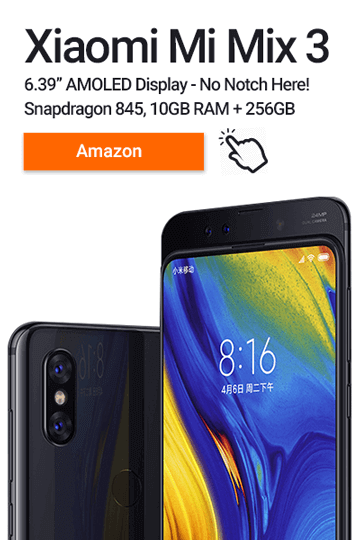 How easy is the PhoneSoap to use? It really couldn’t be any simpler. 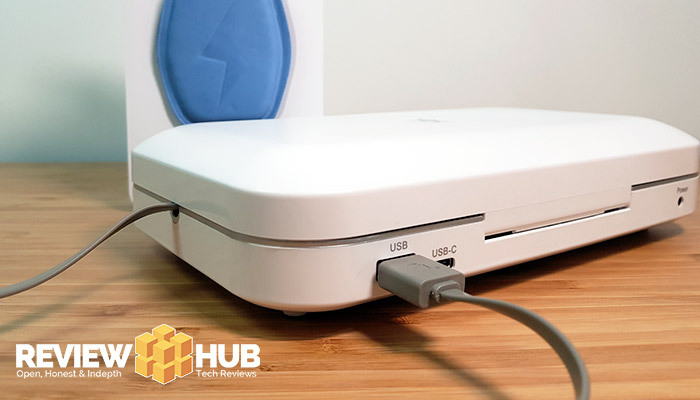 You plug it into the mains power and place your phone or gadget inside. The light on top turns on. 10 minutes later, the light turns off to let you know it’s finished. But you can also charge your device while it’s inside. On the back of the PhoneSoap there’s a USB port and a USB Type-C port. While the name suggests it’s only for your phone, you can also use the PhoneSoap to sanitize pretty much anything that’ll fit in. Rings, jewellery, toothbrushes and credit cards can all be germ free as well. But can’t I just wipe my smartphone to clean it? Of course you can, but if you’re using chemical wipes you’re likely to damage your phone. If your phone is waterproof, then you could just rinse it under the tap regularly, but who has the time for that? I certainly don’t. 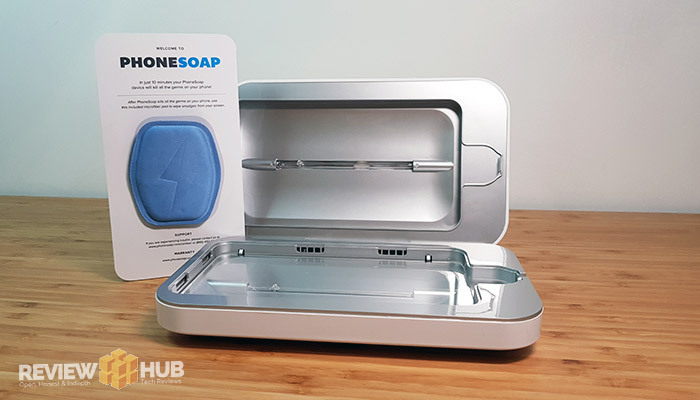 PhoneSoap not only destroys harmful germs but will also charge your device at the same time. If you’ve ever used a robot vacuum cleaner, you’ll know that hands-off automation is the future. Now I’ll be the first to admit that it’s not the cheapest product. But then I remember that the PhoneSoap comes with a lifetime warranty for the UV-C light bulb making it a one-time purchase that the whole family can use. 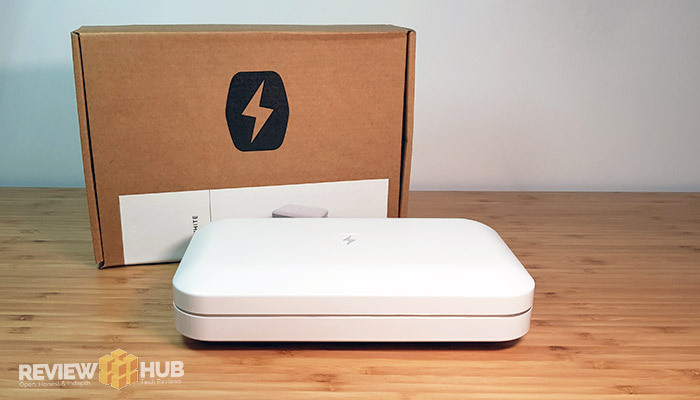 To sum up; the build quality is excellent, it’s so simple anyone can use it, and most importantly, you get to fry those nasty germs! This is one gadget that’s going to get a lot of use! 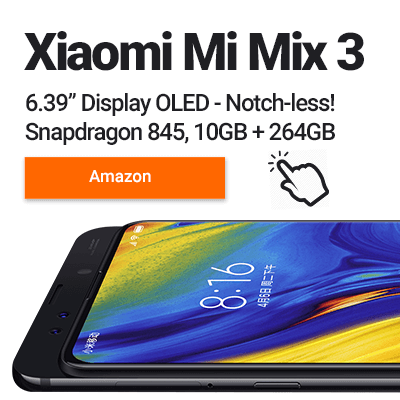 Previous articleWhat Are Dual-SIM Phones? SOLVED!